RKM puts the combined experience of its attorneys to work in safeguarding clients' intellectual property, assisting with trademarks, copyrights, and patents. 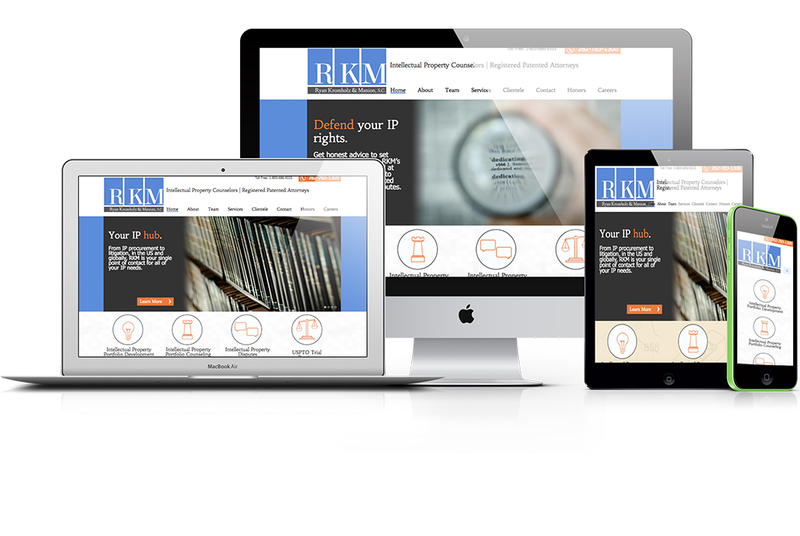 RKM wanted an updated, fresh web presence that easily conveyed information in an approachable manner. They wanted a website that would help them stand out from other IP Law firms. Together, Keystone Click and RKM decided that the new website would take a friendly, informative approach to the design and layout of the website. Keystone Click changed the existing color palette for RKM to be slightly warmer and bolder to create an impactful, yet approachable design. To improve user experience, four icons that represented the main service offerings were created. The consistent use of icons and photography are strong visual elements that draw the users’ eye to where it needs to be. Keystone Click was able to deliver a high functioning, informative, visually oriented website for RKM. Their bold, modern website stands out from the sites of their competition. Through the design and development, as well as the content provided by RKM, we were able to accomplish the project goal of educating users rather than scaring them away. The site was developed using Responsive Design to display on desktop, tablet, and Smartphone screens with ease. The RKM website was developed on the Drupal Content Management System. "Keystone Click has been a pleasure to work with and we are very happy with the outcome. …We didn’t want the same old law firm website. I think we got something that is modern and interesting, while still being professional. …The members of the Keystone Click team are knowledgeable in their field and provide valuable advice. They are a creative group who provide a fresh take and a different perspective than the other firms we have worked with. "